The PSD Precision Screw Driven actuator is a linear motion system that combines Hepco’s Herculane® wheel technology with a lead or ball screw drive for excellent accuracy and performance in a cost effective package. This off-the-shelf solution reduces design and installation costs by easily integrating into machine configurations that require accurate positioning in a compact environment. The PSD is ideal for single or multi-axis applications and is particularly useful in Z-axis applications. PSD comes in two sizes, 80mm and 120mm, and is available in a large range of stock lengths. An assortment of options and accessories are available including Z-axis mounting plates, tubular flange screws, and a wide variety of motor connection kits and screw pitches. The high strength aluminum beam is available in a variety of lengths up to 2,850mm (up to 6,000mm for non-driven units). Special length/pitch combinations may also be specified. The beam comes with T-slots for easy mounting. T-nuts, T-slot covers, mounting brackets and multi-axis connection brackets are available options. The removable carriage plate is easy to detach, and can be rotated 180 degrees to change the switch cam to the other side. Multiple carriage plates on a single unit are possible. A stainless steel sealing strip runs the length of the aluminum beam to protect the internal mechanism from debris. Check out our latest video demonstration of this popular precision screw driven linear guide product line. Can ball screws be used in vertical applications without back driving? No. Without a brake motor, ball screws will always back drive. Can acme screws be used in vertical applications without back driving? For vertical motion, lead screws can be self-locking so that even without brakes, dropping or drifting when motor power is removed or lost can be prevented. But the higher friction of a non-backdriving screw requires increased power to drive. The lead of the screw needs to be less than one-third of the minor diameter to not backdrive. What is the maximum recommended speed for DualVee guide wheel technology? Speeds up to 5.5 meters per second. Can DualVee guide wheels be used in high temperature applications? Specially designed guide wheels using all stainelss steel components, heat stabilized material, and with special grease (Krytox GPL 227) can operate up to 500°F. What is the coefficient of friction for DualVee guide wheel technology? Between 0.005 — 0.02 when operated on DualVee track. 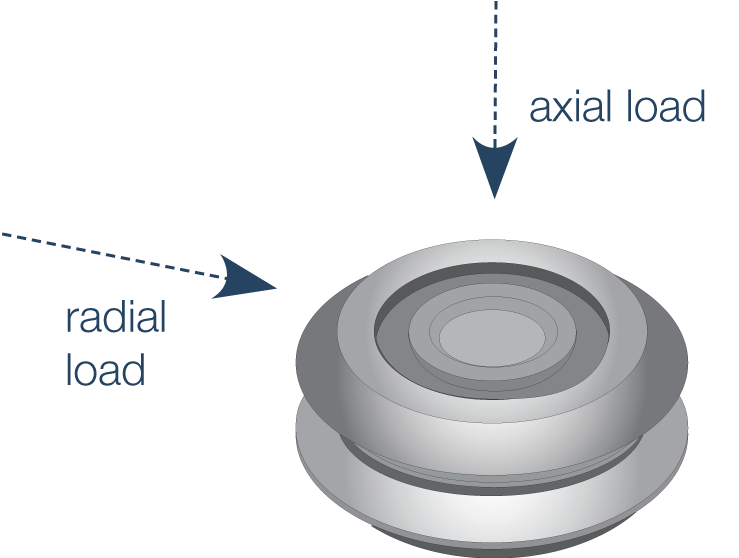 What do the terms 'axial load' and 'radial load' refer to with regard to a bearing? Axial load is any load that is parallel to the axis of rotation of the bearing. Radial load is any load that is perpendicular to the axis of rotation. What are 'Pitch', 'Roll', and 'Yaw'? Pitch describes a vehicle's tendency to rotate forward or backward. Yaw describes a vehicle's tendency to turn left to right with respect to the direction of travel. 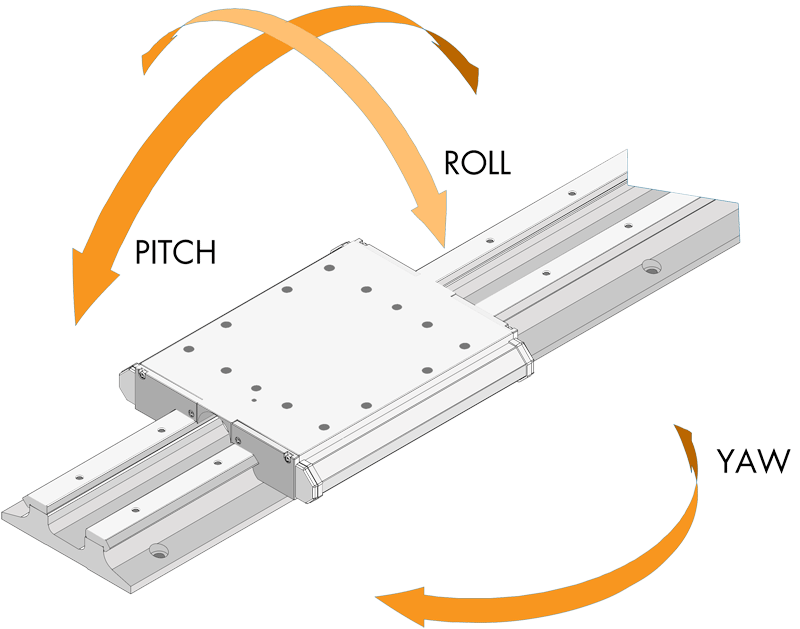 Roll describes a vehicle's tendency to rotate side to side with respect to the direction of travel.